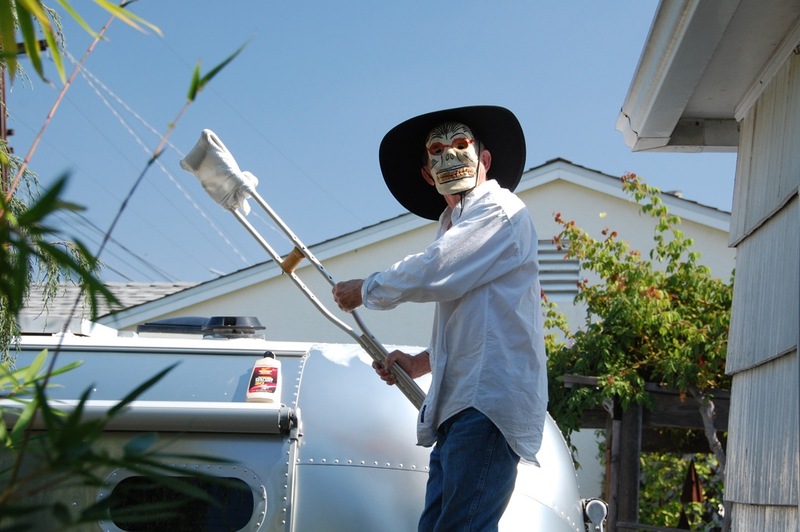 Salt deposits had been washed off our Airstream Safari trailer just after we returned home from our last beach outing, and now it was time for our big annual wash and wax job prior to the beginning of our fall camping season. The trick is to use a good quality wax that is easy to wipe on and off, and provides long lasting protection. 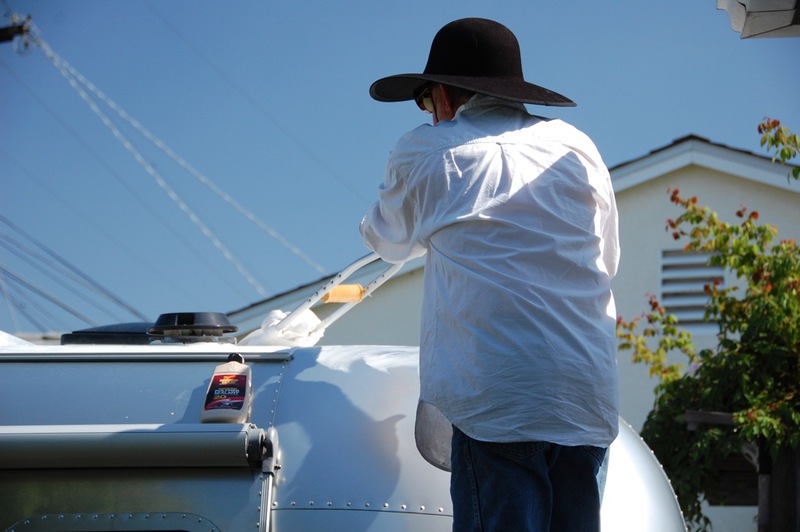 This is the eighth year that I have used Meguiar’s M20 Mirror Glaze® Polymer Sealant to wax the trailer and I have been treated with its ease of use, high gloss finish that makes it easier to rinse off dirt between washings, and its ability to prevent and/or control filiform corrosion. The 16 oz. size nicely covers our entire 23′ trailer, including the roof and air conditioner shroud. The trick is to get it on the roof, and I have a crutch for that, literally. This year, sun safety for my skin was provided by my wide brim plague doctor’s hat, and for a brief moment by a calavera mask, a calaca, a skull mask, often used in celebrating Día de los Muertos* (Day of the Dead). 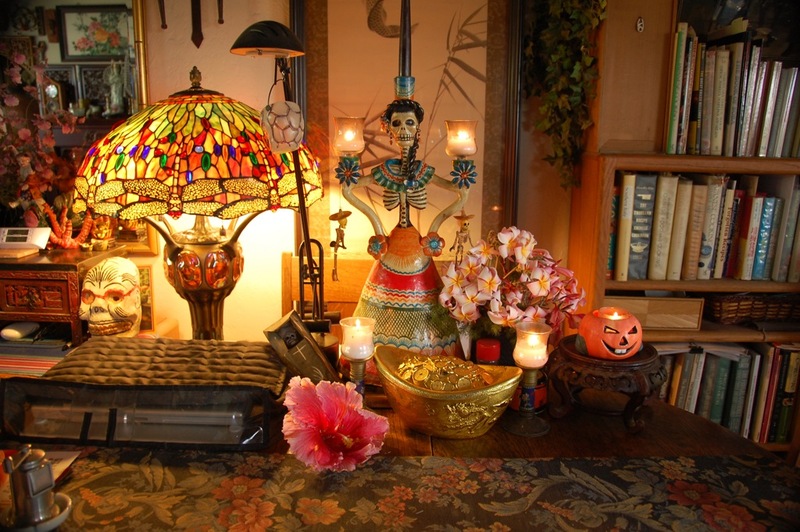 A calaca of Catrina and other symbols of the season already decorate our dining room table and Larry will be baking Pan de muerto (Bread of the dead). For us, this season is also a reflective time for reviewing the past year’s events, the tricks and treats. For example, last November our corgi, Tasha, had a herniated disc, and the trick was to find it with an MRI and to remedy it with a laminectomy, and the treat was that she went on to a full recovery. Last June, we found the trick on how to stop paying $75/month for cable TV channels that we mostly don’t watch, and now we are treated to free TV by using an indoor antenna. Last August, we found the trick on how to stop paying high prices for cell phone service that we rarely need, and we treated our selves to a new service provider, resulting in better service at much lower prices. 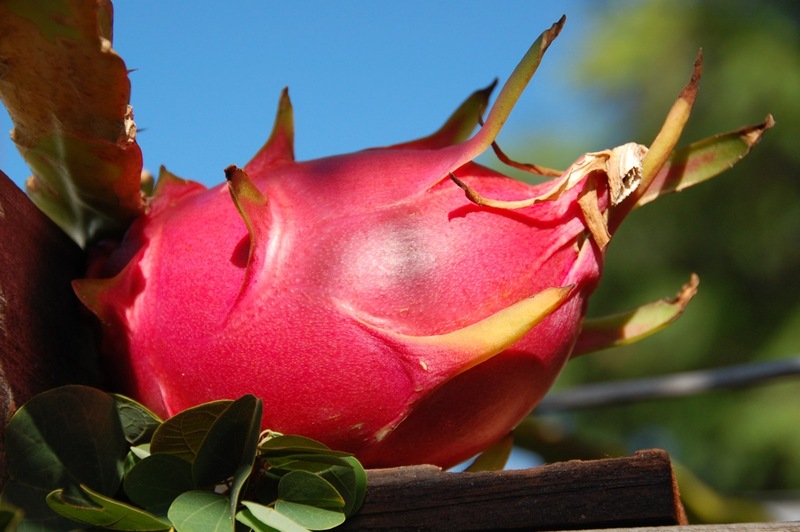 In August, we were also treated to the happy sight of our first pitahaya blooms, and last month, we were treated to the sight of our first fruit after bees and I (with a brush) performed the trick of cross-pollination. 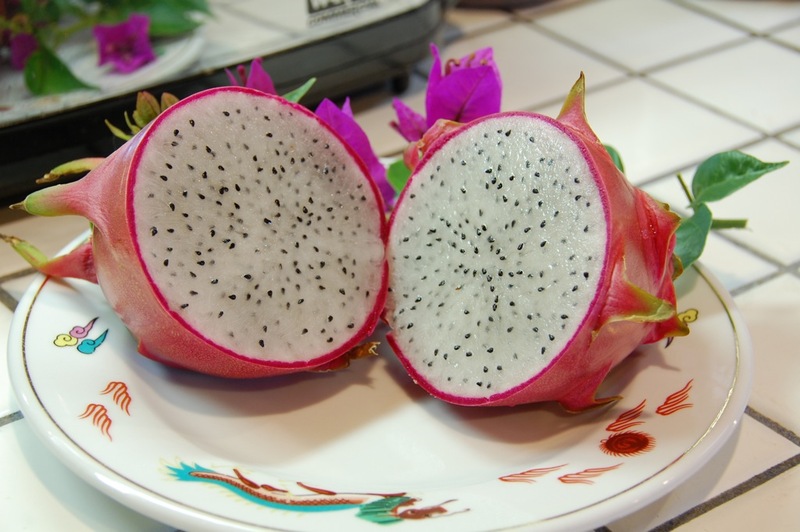 This exquisite dragon fruit was cut in half, scooped out and served with a dollop of premium vanilla ice cream.